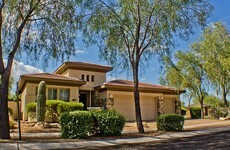 3000 sf Toll Brothers Model home located in the private gated community of Sonoran Foothills. The tranquil setting at the base of the Sonoran Mountains makes you feel like you are away from it all when in fact you are only minutes from everything. 5min from the I-17, less then 10min to the 101 loop, 15-20min to Spring Training, 20min to NHL hockey and NFL football. 25 min toHarbor Airport. The home will sleep 6-8 comfortably and offers surround sound throughout, front bedroom/ games room for the kids, cozy fireplace in the living room to snuggle up to with a glass of wine and good book. A games room has a shuffleboard table and wet bar for entertaining. The family room is equipped with a 56’ Plasma wifi 3D television with BlueRay DVD, inwall surround sound system, Netflix, and Canadian/US Satellite for those of you wanting to watch CFL football and or NHL hockey along with NFL and MLB. The gourmet kitchen is fully equipped with in wall oven, microwave, garburator, dishwasher Viking refrigerator with filtered water and everything you need to entertain. The covered patio also offers in ceiling sound with volume control to listen to music as you grill on the built in bbq island, enjoy a frosty drink from the drop in ice chest at the sit up bar or relax on the stairs of the pool with waterfall feature. The backyard is private and quiet and offers an inground spa, seating area to enjoy the mountain views, humming birds and the peaceful tranquility of the Sonoran Foothills. The home offers a large master retreat with 42’ plasma satellite television. The huge walk in ensuite offers granite counters, his and her drop in sinks, a huge walk in snail glass block shower, oversized jetted tub with views of the mountains behind and in ceiling audio. There are also two additional bedrooms with queen beds each with their own access to a jack and jill bathroom with his and her drop in sinks, shower and tub. We have taken great pride to offer our guests a luxurious comfortable interior with fine linens, extra pillows, thick comfortable duvets, closet organizers, leather furniture, beautiful artwork, audio/visual systems, thick beach and bath towels, floaties for the pool, natural gas grill and the list goes on. Our home is perfect for a romantic getaway, girls shopping trip, guys golf trip with more than 50 golf courses within a 30minute drive or sports trip including NFL football, NHL, NASCAR or Barret Jackson weekend as we are only 5minutes from the I-17. Desert Ridge and City North is 15minutes away. Upscale shopping and dining in Kierland Scottsdale is only 15-20minutes away. Lake Pleasant is only 15minutes away and offers a beautiful marina, the Waterfront Grill and boating. The Shops at Norterra are less than 10 minutes away and offer movie theaters, PF Changs, groceries, WalMart, Anytime Fitness, Paradise Bakery (one of my favourites) banking, and much more. The home has a 4 car garage, soft water, front load washer and dryer with detergent and ironing board. Beachy Villa In The City! Steps To Downtown! Newly Renovated!